Apple will release iTunes Radio for cars with its automotive partner Nissan, who will install the format exclusively for the Rogue, Versa and Leaf models. Nissan has announced that it will be the exclusive automotive partner for the launch of Apple's iTunes Radio, taking advantage of new creative formats, including audio and video via Apple TV, iPhone, iPad, iPod touch, Mac and PC. Among the first vehicles Nissan that will have the system are the new Nissan Rogue SUV, the new Nissan Versa Note and the vehicle Nissan LEAF electric. "We see iTunes Radio as an integral part of our new vehicle launches". The wave of interest and use of this new service to maximize exposure of the new Nissan models is exciting, "said Jon Brancheau, Vice President Marketing, Nissan North America, Inc.
"We are also adding iAd on iTunes Radio as a critical platform to support the existing campaigns, such as college football and the Heisman Trophy. This is a great way for Nissan to reach appropriate audiences in the right markets", said Brancheau. The campaign theme for the new Nissan Rogue is "Make the Extraordinary, Ordinary". The Rogue is known for being one of the cheapest SUV available in the U.S. market. You can get it brand new for only $20,000 dollars. Marketing efforts are designed to boost the reserves for the vehicle, which will be on sale at Nissan dealerships nationwide in November. The presence of the Rogue in iTunes Radio is an important part of this effort. 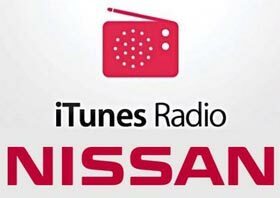 "Nissan is proud to support iTunes Radio from the beginning, with content relevant to the interests of consumers," said Brancheau. "We see iTunes Radio being a great success, and we hope to offer incredible brand experiences to this exciting new audience." The Nissan Rogue is produced in the plant of Kyushu, Japan, and is the U.S. version of the Qashqai of European design, and known as Dualis in Japan and Australia. More reasons to get distracted and crashing while driving. Shut up and take my money! I'd love that feature in my Civc.